When hiking Picketpost on the normal route from the trailhead just off the US 60 you get a 1.5 mile warm-up before the 1 mile climb to the plateau. Not from the east... 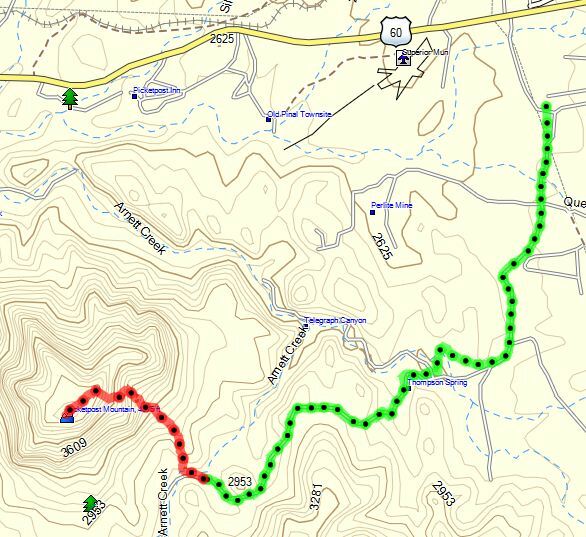 The drive to the TH will be challenging enough for most hikers then you barely have a 100 yard warm-up before beginning the roughly .9 mile climb to the northeast corner of the plateau. Your route will vary and very likely you will seek an easier route on the return so your route selection skills will be put to the test. While I did not successfully make the summit on my first attempt, I know the route is doable. I was within 300' of altitude of the horsehoe cross when I had to turn back due to weather fast-closing to the point I could not see 20' ahead. Another attempt is coming very soon, when I will also try a completely different (and steeper) return route. Picketpost from the west is something any hiker in decent shape can do... Picketpost from the east? Well this one will separate the men/women from the boys/girls. You'll need good climbing skills (no ropes!) and plenty of stamina along with a willingness to travel up steep and at many times loose terrain that may slide with no prior warning. But for those who consider themselves worthy of a challenge (albeit a short one) it's a great way to see and experience awesome views from a completely new vantage point. Take US 60 east to Superior. Immediately after the first 45 MPH speed limit sign look on the right for Mary Drive. The street sign is faded almost completely but it is the first paved road heading south. Turn right and travel south on Mary Drive until you reach Superior High School and Mary Drive turns left. [b]Set your odometer at this point. [/b] Turn right onto Golf Course Road (adjacent to the Superior Fire Station) and continue south first on pavement which changes to dirt about 1 mile out. Stay on main road until a noticeable fork at 1.4 miles when you will turn right and immediately veer right at a smaller fork and continue on FR 4 ("4" is all that the sign is marked). Follow the road as it winds left, through the wide, low wash then winds right past a large 'shooting pit' and continue west. You will cross over a normal cattle guard then a short time later there is a stepped one requiring a bit more clearance, take your time over this one. In this area you will encounter a number of steep rocky up-and-downhills requiring careful tire placement but again with care a 4x4 with reasonable clearance can make it just fine. At a point [b]3.7 miles from Superior High School[/b] veer off to the right and park in the open area alongside the road. Begin your hike from here.